Measure BB is an Alameda County ballot initiative that, if passed this November, would expand an existing sales tax to fund dozens of critical transportation projects in our community through 2045. Transportation can be a frustratingly divisive issue, as we’re often inclined to see the road or a budget as something to be carved up and split among competing users. Measure BB is different – it would directly benefit every resident, employee and visitor in Alameda County, regardless of transportation preference or choice. Using sales taxes to fund local transportation projects is common across the United States. Each time it works about the same way: the initiative’s sponsors outline a list of specific projects to be funded and put it to the voters. Alameda County voters approved our first sales tax for transportation in 1986, and reauthorized it by a whopping 81.5 percent in 2000. The current measure will remain in place through 2022, but most of the capital projects have already been completed, and we need voters to approve a new project list. Browse the full list online, or in your voter information packet. As a long-time student, practitioner (years with an consulting firm), and user of transportation, I appreciate this opportunity to publically reflect on the value of predictable local funding for transportation projects. Nationally, our infrastructure is funded through a patchwork of laboriously negotiated federal and state policies. The Federal Highway Trust Fund is insolvent, only kept alive by regular billion-dollar infusions from the General Fund. Congress hasn’t been able to make any significant revisions to its transportation funding plan since 2005, or around the time Americans started making a measurable shift from their cars to alternative modes. Receiving funds through a collection of inconsistent and small amounts puts transit agencies and cities in a bind, and keeps their focus on patching rather than building. Not reallocating transportation funds means that we’re continuing to build more roads and spend less on trains, even though Americans as a whole are shifting their travel behavior (a shift that is particularly visible in the Bay Area). This is where I would like to link to my favorite Onion article of all time: Nation’s Crumbling Infrastructure Probably A Metaphor for Something. Measure BB is the opposite. Measure BB gives Alameda County’s transit agencies and cities 30 years to spend these tax dollars. This certainty gives BART the breathing room to build new capacity, knowing it will be able to maintain that capacity for a generation. Cities will be able to spend money quickly and fix urgent problems, knowing exactly how much is on the way next and when it will arrive. Instead of a cobbled assortment of projects passed down from Congress, Measure BB’s funding priorities are entirely decided within Alameda County. Two public advisory groups, with thousands of comments and surveys from the larger public, picked exactly the priorities and balance of projects that would best serve Alameda County. As the urban core and economic engine of Alameda County, Oakland will bear most of the burden and benefit of this transportation sales tax. As Oakland voters decided by over 75 percent in 2012 with Measure B1, these are projects worth funding, and continuing an existing sales tax is a fair way to do so. If you move through Oakland by foot, car, train, ferry, bicycle, or bus, vote yes on Measure BB. Ruth Miller is a Lakeside Apartment District resident and Transport Oakland member. She is a former Walk Oakland Bike Oakland policy fellow, and has degrees in transportation planning from MIT and UC Berkeley. 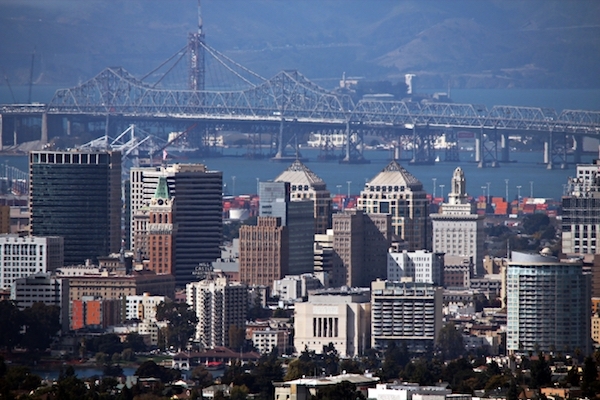 You Tell Us is Oakland North’s community Op-Ed page, featuring opinion pieces submitted by readers on Oakland-related topics. Have something to say? Send essays of 500-1,000 words to staff@oaklandnorth.net. We’d love to hear from you! All essays reflect the opinions of their authors, and not of the Oakland North staff or the UC Berkeley Graduate School of Journalism. Oakland North reserves the right to edit submissions for length, clarity and spelling/grammar. Oakland North does not pay for the the publication of opinion pieces. You Tell Us submissions must be written in civil and non-offensive language. We do not publish hate speech, libelous material, unsubstantiated allegations or rumors, or personal attacks on individuals or groups.